When I think of lemons, the first thing that comes to mind is lemon curd. I love slathering it on a scone or using it as a tart filling, but most of all, I love eating it straight out of its container, a spoonful at a time. This particular recipe, from Spago Restaurant’s pastry chef, Sherry Yard, has been my go-to recipe for lemon curd for a while now. It is from her first book, The Secrets of Baking: Simple Techniques for Sophisticated Desserts. This lemon curd is a beautiful pale yellow in color with flecks of zest and has just the right amount of tartness. 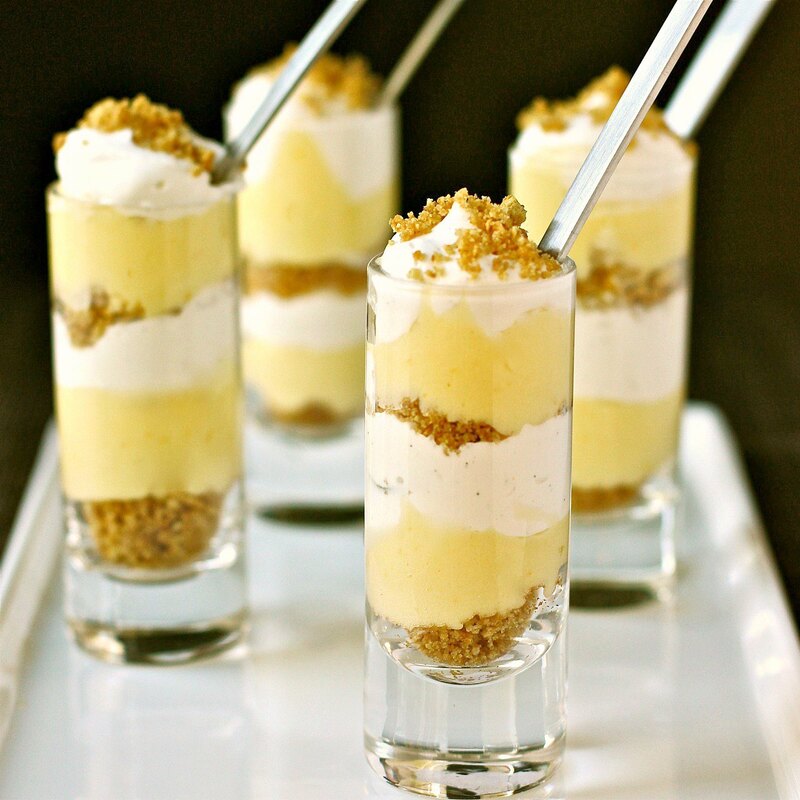 It is the featured component of these Mini-Lemon and Vanilla Cream Parfaits, which also have layers of buttery graham crackers and vanilla bean whipped cream. When I entertain, I really enjoy giving my guests options, especially for dessert. Serving a couple of different mini-desserts gives my guests the chance to sample from a choice of sweet treats without eating big portions of each one. I also love serving these parfaits in tall shot glasses for a pretty presentation. Place the bowl and whisk attachment of the stand mixer in the freezer. The coldness of the bowl and whisk helps the cream whip more quickly and easily. To make the “crust”, combine graham cracker crumbs and sugar in a small bowl. Add the melted butter and mix until all the crumbs are moistened. Set aside. Remove the bowl and whisk from the freezer. Pour cream into the bowl. Whisk until the cream begins to form soft peaks. Add the sugar and vanilla and continue whisking until the cream reaches desired thickness. (I like the cream to be a little soft for these desserts so they spoon into the glasses easier). To assemble the parfaits, place a layer of graham cracker crumbs on the bottom of each shot glass. Spoon a layer of lemon curd and a layer of vanilla cream. Repeat with another layer of graham crackers, lemon curd, and vanilla cream. Top with more graham cracker crumbs. Prepare an ice bath using a large bowl to hold the ice. Fill a medium saucepan 3/4 full of water and bring to a simmer over medium heat. Combine sugar and lemon zest in a food processor and pulse until sugar is yellow and very fragrant, about 1 minute. This action heats up lemon zest, releasing its oils into the sugar. Combine lemon/sugar mixture, eggs and egg yolks in a medium heatproof bowl and whisk together 30 seconds to distribute sugar evenly. Place bowl over the simmering water and immediately begin whisking. Whisk continuously until sugar dissolves, about 20-30 seconds. Add lemon and lime juices (or all lemon juice) and cook, whisking continuously, about 5 minutes. Use a rubber spatula to scrape sides and bottom of bowl occasionally. The curd is done when it has the consistency of sour cream and a temperature of 160 degrees F, using an instant read thermometer. Transfer lemon curd to a large bowl or to the bowl of a food processor. Pulse while you add butter, piece by piece, or whisk it in by hand in the large bowl. Once all butter has been added, pulse or whisk 10 seconds, or until texture is homogenous. Strain lemon curd through a fine-mesh strainer into a bowl and set in ice bath to cool. Cover with plastic wrap, pressing it directly onto surface of curd to prevent a skin from forming. Stir occasionally until it has cooled completely. 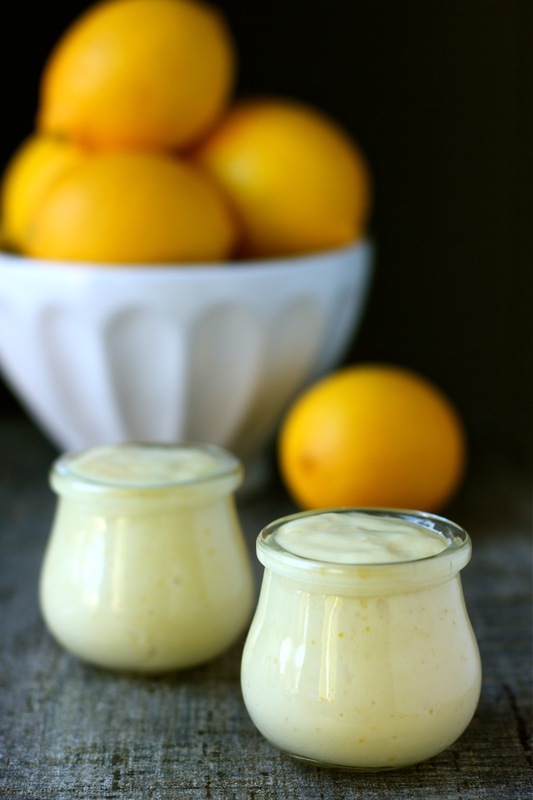 At this point, lemon curd can be used or refrigerated in an airtight container up to 1 week. I am sure that this dessert is delicious! Thanks for sharing. YUM!!!! These look so great. I swear I can smell the meyer lemon just looking at them. How absolutely divine. Love those little pots…. Oh my gosh these parfaits look incredible! I am definitely trying this one soon. Yum! Thanks, Russell! I have been an admirer of your amazing blog for some time. I can’t wait to see your take on these and the beautiful photos that are sure to accompany them. Truth be told, your blog is one of the ones that inspired me to finally start mine. (I’m actually having an OMG moment right now!) I showed yours to my husband and told him that I wish I could do a blog like yours and he looked at me and said point blank, “Then, just do it and put your own personality in to it.” I found a link to Taylor Takes a Taste on your blog and that’s how I started learning more about food photography. Thanks everyone! I’m glad to share my love for lemon curd with fellow admirers. These look beautiful! Brilliant photographs as usual! Daisy, this is my dream dessert! How beautiful. Oh my gosh, be still my beating heart! I could use one of those parfaits right about now! (I’m moving, and my kitchen is in boxes.) What an appealing recipe! Daisy, they look absolutely wonderful! I think it’s so awesome that you’re using your own home-grown lemons! As always your photos are amazing… Lemon curd is so yummy. I love lemon curd. You are lucky to have over twenty ripe lemons at once — our tree produces five or six at a time, I’m making tangerine curd in a few days and will be posting it on the blog soon.